I should have started gardening more seriously long ago, but it has been a half-hobby for a long time. I would buy some seeds or rescue a tomato plant growing in the cracks somewhere (I've seen them growing sporadically in lots of places, including in the wall of a subway station entrance, the hearty little things) and cultivate them for a while, sometimes harvesting the fruits, sometimes just taking pleasure in watching new leaves form and being near growing things. Usually I would let them die off in winter or if I got incredibly busy or if I was going to move soon, and then the process would repeat. Now, however, I am planning for the spring and want to take a new approach. The idea is to have a dream garden in mind, with a bunch of varieties of a bunch of vegetable, fruit, and herb plants, and then work slowly to accumulate them. I'll buy a handful of varieties of seeds this year and harvest more seeds from the crops to prepare for the following year, thus I can continually add to the garden without needing to repurchase seeds. First off, I kept stumbling upon the word "heirloom," which seems to mean different things in different contexts. 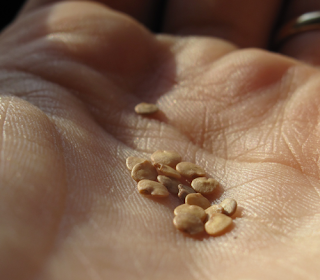 Sometimes it means that the same variety of plant has been grown since early human history (for various definitions of "early"), and sometimes it simply means that a variety's seeds can be saved. Sometimes, however, it just means that a particular supplier has been producing that variety for a long time, and in the case of hybrids, harvested seeds won't necessarily produce the same results as the parents. So in selecting seeds for my garden (which I am going to dub "heirloom" because I can), I wanted to avoid varieties that would not give me the seeds I wanted, namely hybrids. I ordered seeds from Burpee, which seems to have a pretty good selection, and is good about labeling whether or not a variety is hybrid. I know that there are other fantastic seed-selling websites, many of which cater more to seed-saving, but this worked for me. I've looked into the way a lot of plants produce seeds and have also needed to learn more about our climate, which is new to me when it comes to gardening--no citrus here, for sure, but that's obvious. I've found out that despite my love for carrots, they don't seed until the second year (no matter how much adoration you beam at them), so those are out for the first year, as are a lot of root vegetables. I wanted to start with varieties whose seeds are easy to harvest, which means plants whose fruits are edible. For vegetables, this includes tomatoes, peppers, squash, etc. In the end, I went with a bunch of tomato and pepper variants as well as one breed each of eggplants and tomatillos. For all of these plants, it'll be easy to control pollination and harvest the seeds. I'll probably get some violas for under the taller plants and maybe chamomile as a border, but those don't need to be germinated indoors like the rest of my selection. Today I planted my seeds, which was probably a little more of an elaborate process than it should have been. I made garden markers out of aluminum flashing--I simply cut the sheets into the shape I wanted, filed the edges, and wrote on them with permanent marker. Maybe one day I'll get one of those fancy stamping sets that I could use instead of the marker, but that worked for now. I used a long flat storage bin as a planting container and set it on our sunniest windowsill, which isn't really that sunny at all, so I hope the seedlings will be okay. Our central heating comes out right where the container is, so the seeds will be nice and warm, which is important for germination. To be sure that they didn't get too warm, I propped the container up with squares of folded cardboard. And now I'm trying to get back to work, but keep looking over at the container every few minutes or so. They aren't going to sprout that quickly, silly girl. I just can't wait to see the little seedlings emerge!